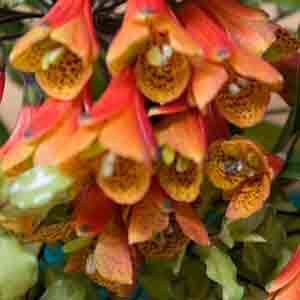 Bomerea are a group of climbing plants that include : Bomarea caldasii , Bomarea edulis and Bomarea hirtella. These are a tuberous plant and B. caldasii is sometimes called the ‘Climbing Alstroemeria’. The flowers tend to resemble the Alstroemeria however appear in large clusters and are a real show stopper when in full bloom. Most unusual and rare, they have very colourful flowers that are produced in large clusters. They do need a mild winter or a sheltered position, and do not like to be disturbed. Flowers are mostly in the red tones. It is B. caldasii that is most widely grown, an evergreen climbing species with attractive orange to red flowers flecked with deeper brown to red spots inside. The flowers appear in large clusters in summer and are long lasting. Also known as the Peruvian Lily Vine. B. multiflora has large clusters of attractive orange flowers with deeper coloured spots, a better choice for cooler climates than others. This is a smaller growing species, excellent in a warm protected position in light shade. These are a vigorous plant, however they are a little frost sensitive. So in cooler climates just prune them right back to ground level in winter. They will reshoot from the tuberous root system in spring.